I just noticed that the last day of school for this year is on Dec 18th. I guess I am more excited than Nikolai is, lol. We finally mailed out most of our International packages and the post office is super busy this time of year. My poor hubby had to stand in line for around 30 minutes while I sat in the car and waited for him. I am sure we'll be going there again at least a couple of times before Christmas. 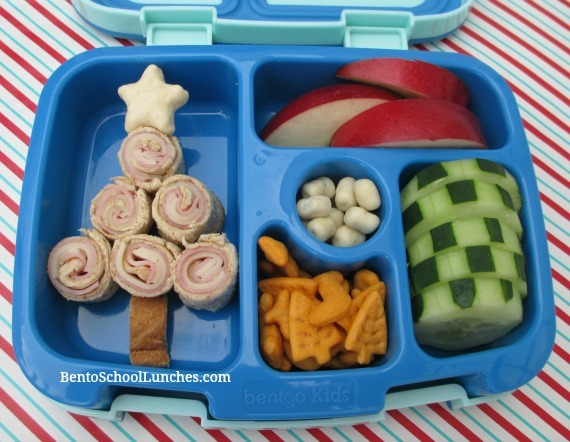 In this bento lunch: Whole wheat bread roll-ups arranged to look like a tree with a bread crust tree trunk and a yogurt covered star. Alongside are organic apple slices, Greek yogurt covered fruit snacks, holiday edition goldfish crackers and cucumber slices. This lunch was packed in a Bentgo lunchbox. I love this lunch, simple and cute! Very creative and yummy Christmas tree!